The following post was originally featured on April 30 2013. The mystery of the “strange malady” at Creswell Bay captured the mostly-southern media. [ii] Initial reports suggested influenza or starvation was the cause. Then, a “plague” of gangrene: this after one of the two survivors was sent south with severe gangrene in both of his feet. [iii] Typhoid and food poisoning were posited next. One newspaper reported that food poisoning resulted from “inhabitants of the village … eating parts of the carcass of a dead whale which had washed ashore.”[iv] This last comment was pure speculation on the part of a journalist, who aimed to make sense of what was, in fact, a much more complex and challenging story. 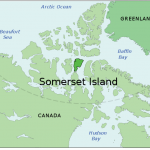 The Inuit who fell ill at Creswell Bay had been relocated first to Arctic Bay (Ikpiarjuk) from Pond Inlet (Mittimatalik) and Pangnirtung in 1936 and then, the following year, to Fort Ross at the south end of Somerset Island. In 1947, when the post at Fort Ross closed, they were moved again to Spence Bay (Taloyoak) on the Boothia Peninsula. They made repeated requests to be returned to Baffin Island, but to no avail. In 1948, these Inuit crossed Prince Regent Inlet to Creswell Bay and en route consumed some walrus meat. Walrus was a common food for the relocated Inuit in their home region, and walrus liver was regarded by many Inuit as a delicacy. However, by contrast, the local Netsilingmiut of the Arctic coast west of Hudson Bay were “very superstitious about eating the liver of the Bearded Seal or the Walrus, saying that if one eats this the skin will fall off the person’s face and arms.”[v] This horrific description presents, with some accuracy, what happens to a person who suffers from hypervitaminosis-A (or an excess of vitamin A), which can cause excessive skin peeling particularly on the arms, legs, and face, in addition to a headache, nausea, and debility. Moreover, this was what one of the surviving Inuit, the teenage Kayoomyk, had described as experiencing, after he was evacuated with serious gangrene in his feet. Alternatively, the “strange disease” may have been trichinosis, as the group had suffered from serious diarrhea (a contributing cause in some of the deaths). Either trichinosis or hypervitaminosis-A can result from eating the liver of so-called “carnivorous” walruses. Most walruses rely on a wide range of benthic organisms such as shrimp, crabs, molluscs, clams, soft corals, and sea cucumbers. 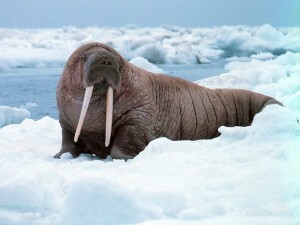 In areas where such food is scarce, walrus have been known to eat warm-blooded mammals, such as seals and even whales; it is these walruses that are described as carnivorous. In eating other marine mammals, and especially in eating their blubber where vitamin A is concentrated, the carnivorous walruses consume much more vitamin A than their benthic-organism-eating counterparts. Their livers become – like polar bear livers – highly toxic to humans. Trichinosis is caused by consumption of the Trichinella spiralis parasite, which “is primarily a parasite of carnivores and its transmission is mainly accomplished by one mammal eating the infected flesh of another.”[vi] The relocated Inuit had not worried about walrus livers in their homelands and considered them safe to eat. They ate these livers after their relocation to a new environment with tragic consequences. Beyond the immediate tragedy, this particular story can tell us much about the larger history of country food hazards in the North. The discovery of mercury contamination in freshwater fish in the early 1970s led directly to concerns about toxic contamination of country food resources across Canada and particularly in the North, where freshwater fish remained a major part of local diets. Given the cultural and health importance of traditional foods, the hazards brought by industry (whether located in the North or far beyond) present a major, complicated, and ongoing issue. But the history of toxic food, as we see here, does not begin with industrial contaminants. Botulism, trichinosis, and hypervitaminosis were serious food hazards throughout the twentieth century. Knowledge of local environmental conditions, as well as care and attention in harvesting and food preparation, was essential to mitigating these and other food hazards. Studying the longer experiences with and knowledge of northern food hazards can teach us much about the construction and transmission of place-based expertise in harvesting the resources of lands and waters, as well as the ways this expertise was both sustained and disrupted by new colonial and industrial relationships in the twentieth century. This post is drawn from a chapter, “From Subsistence to Nutrition: The Canadian State’s Involvement in Food and Diet in the North, 1900-1970,” that will appear in Brad Martin and Stephen Bocking, ed., Perspectives on the Environmental History of Northern Canada, with the University of Calgary Press. Liza Piper is an associate professor of History at the University of Alberta. She has published widely on health and northern environments and twentieth-century industrial change, including her 2009 book with UBC Press, The Industrial Transformation of Subarctic Canada. [i] “North Mercy Flight Enters 2nd Phase,” Edmonton Bulletin, 17 Mar 1949, p.13. [ii] “Two Planes Fly to Aid Plague-Ridden Eskimos,” Edmonton Journal, 1 Feb 1949, p.1-2. [iii] “Eskimo ‘Plague’ Gangrene, Two of Stricken Flown Out,” Winnipeg Citizen, 15 Feb 1949, [n.p.]. [iv] “Whale Meat Blamed for Mystery Ills” Edmonton Bulletin, 22 Feb 1949. [v] Extract from report of Mr. A. Stevenson, Northern Administration, Western Arctic, March 1949, RG 85 vol. 1511 file 1000/128?1 part 2. [vi]Francis H. Fay, “Carnivorous Walrus and some Arctic Zoonoses,” Arctic 13, 2 (1960), p. 115.